If you are looking for a premium meal that is ready to eat - no prep work required - look no further than Dak Canned Ham. 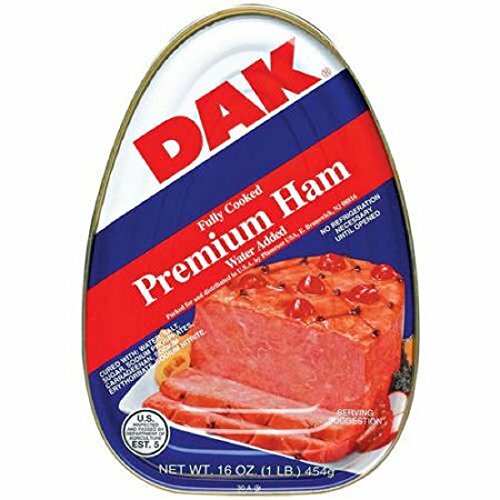 This packaged Dak Ham is fully cooked and does not need to be refrigerated until opened. US Inspected and passed by the Department of Agriculture, this fully cooked ham makes a quality meal while camping or on a picnic and can even be prepared at home as a simple, comforting meal. The Dak Canned Ham can be transferred to a baking pan and placed in the oven for the option of eating it warmed up. Easy to cut up and add to a variety of recipes, Dak Ham is a convenient ingredient that takes the stress out of cooking. It can also stay in the pantry for a long period of time without going bad. Dak Canned Ham brings you a quality flavor you can rely on quickly.